I've had several requests to produce pdf/printable versions of tutorials for blocks. I totally understand the urge. 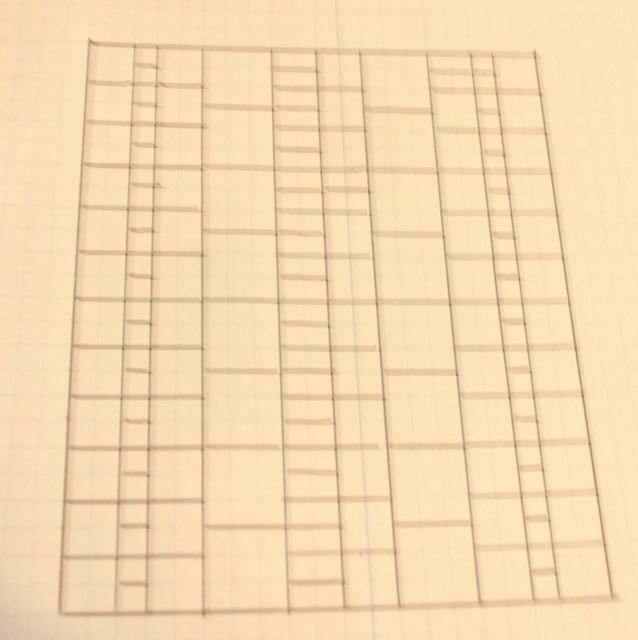 Some people have told me that they took all of the patterns and printed copies to keep in a binder. That would take a lot of paper! Having a nice, compact recipe seems like a great idea. 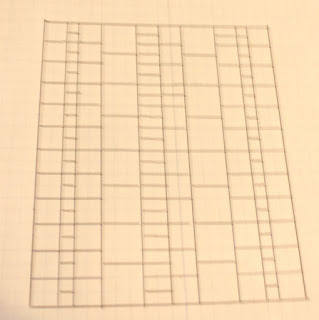 So I started playing with some formats, and wanted to get feedback from you, my loyal blog readers, as to what you would like to see in a block pattern. 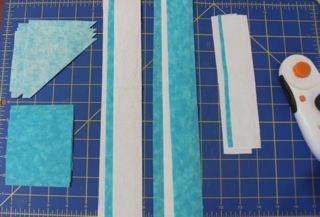 I am envisioning a one page printable version of the tutorials that I have already made, similar the two practice pages I made and posted for Half Square Triangles and Roman Stripes on my new web page still under construction. Would you like to see a picture of the finished block at the top? Do you want separate sections for cutting and sewing? What about fabric requirements? Would some nice graphic boxes make things easier, or is a simple chronological set of steps best? 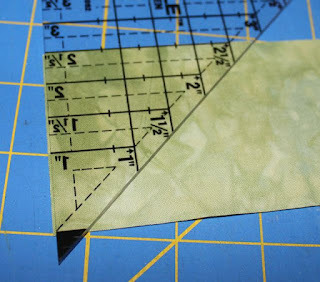 Most of my block tutorials use the easy angle ruler, do you need alternative cutting directions for non easy angle users? Let me know what is important to you and I will try to work on getting some of the old patterns converted while keeping up with the new patterns as they are produced. I'm not making an promises as to time frames. 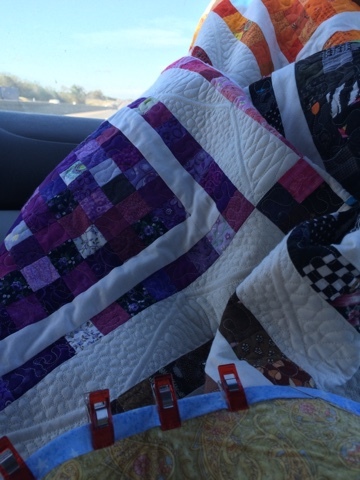 I am after all, not a professional quilter, but a busy working mom who tries to fit quilting into my spare time. Even so, I feel that I have enjoyed the efforts and ideas of so many other people through the years, and I am at the point in my quilting evolution that I would like to give back to the community. So tell me what you want, and how you want it to look, and I will do my best to make it happen. The 7 hour trip home took more than 8, but there was plenty of time to stitch up 15 Orange Peel blocks along the way. I guess that is to be expected on a holiday weekend. It feels so good to be home again! 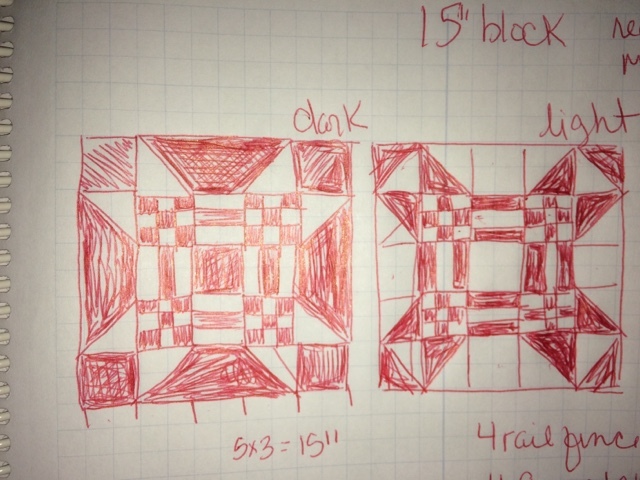 When we were unpacked and laundry going, I started firming up plans for the RSC16 Challenge Quilt. 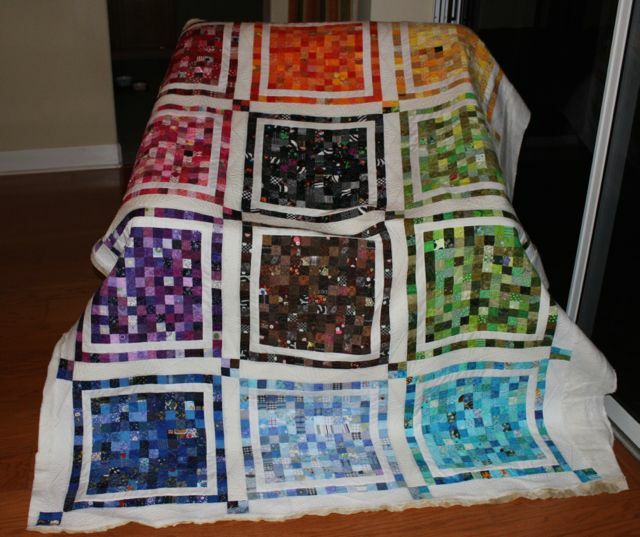 It is, of course, possible to participate in the Rainbow Scrap Challenge without joining in to the sampler quilt fun. 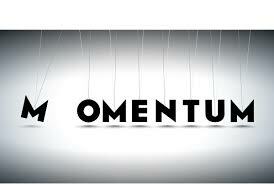 Many people are perfectly happy working on their own projects and blocks throughout the year. 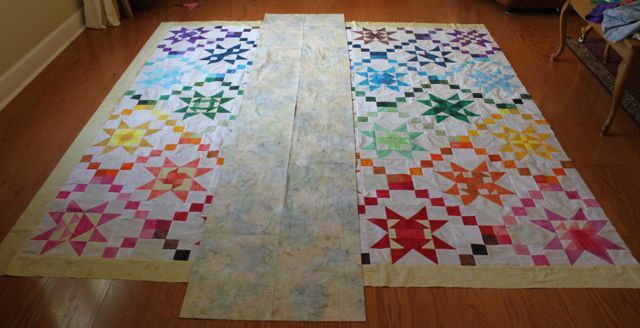 For those still searching for inspiration though, I will be posting tutorials for a column-along quilt. 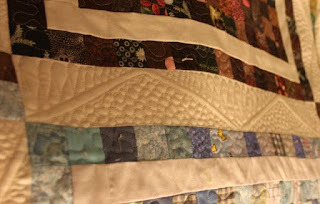 I even gave the new quilt its own tab at the top of the page to keep track of the new blocks as they are published. 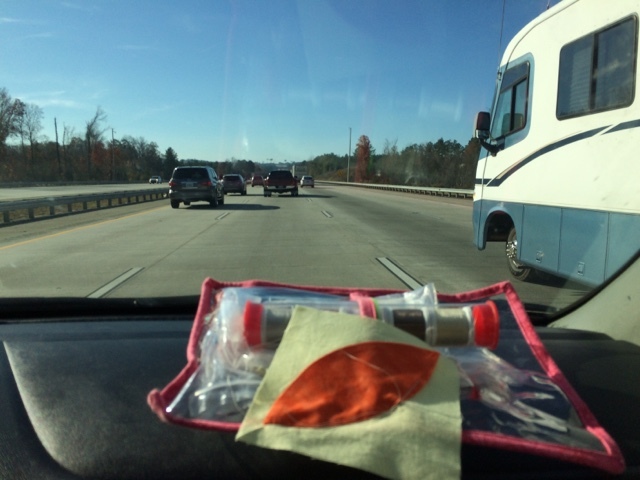 Cruising down the highway, stitching away happily on my orange peels. 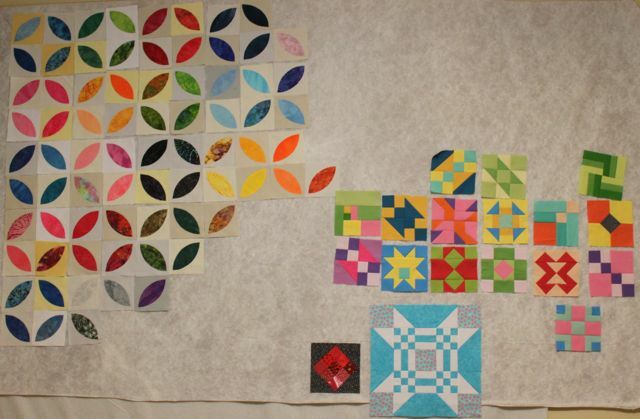 I am determined to finish these off on the next two months to be able to start Quilty 365 circles with a clean slate. 7 more hours in the car. I should be able to accomplish quite a bit in that time. 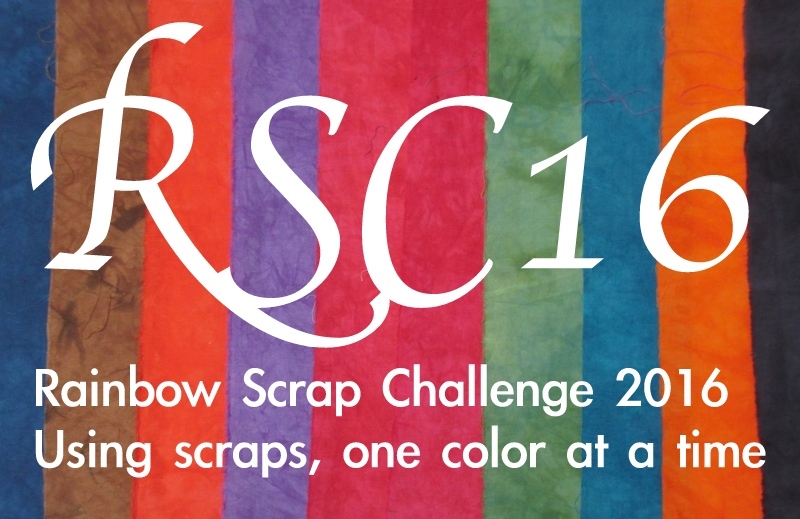 It has been really exciting to see the finished Rainbow Scrap Challenge projects start to appear as the end of the year grows near. If you want to head up to the RSC16 tab at the top of the page, you can start to get an idea of the plans in the works. Though I have started to play around with patterns and plans, my first priority is finishing off current projects. Knowing that I want to start several new projects has me madly trying to shorten the list of ongoing quilts. Misterlinky is below for any updates on your rainbow scrap projects. We don't do as many road trips as we used to before Mom passed away. I'm all set up though with binding to sew. Best of all, I have a quilt handy to snuggle under if I need a nap. I draped a finished quilt over a chair to dry last night, and this is what I woke up to. That helped me decide to get the binding on sooner rather than later before things started to get frayed or ravelly. After much thought, I went to the 2.5 inch strip bin and pulled out a red strip, and orange strip, a yellow strip, all the way to the end of the rainbow. The binding is all machine sewn now and ready for some slow stitching in the car. Of course, but the time that was done, it was too dark to get any good pictures. Shorter days and cooler weather are really making it feel like winter around here. Still going strong, I went ahead and put the last border on this year's sampler quilt. Now all that remains is to applique down the tear drops. More applique for the car? Most people worry about clean laundry when they are getting ready for a trip. I am madly trying to figure out which quilts I can get finished before it is time to leave. 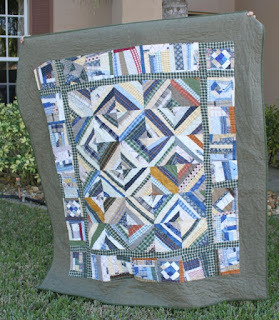 This quilt was based on giant Postage Stamp blocks. Eventually I started calling it Bulk Mail. It is fresh off the frame and hanging to dry after being spritzed with water to remove the water soluble blue marker from the quilting. Right now I am in the phase of noticing all the flaws. Tomorrow though, in the light of day, I will think about binding and take some glamour shots. It is unheard of for me to find energy to sew on a school night, but with Thanksgiving break starting on Wednesday, lessons are winding down quickly. I even took Sydney to LAX tonight and still found time to finish off the last third of the quilt when I got home. Amazing! I think it is the nip in the air that is giving me a new bounce in my step. A chill has definitely arrived. We were all scurrying to find long pants and jackets this morning. I know that doesn't sound very cold to those from up north, but anything resembling seasons is a welcome change for us transplanted southerners. It is that time of year when the list of quilts that can get finished this year gets separated from the list of projects getting carried over to next year. Orange peels are ready to be finished off. I just prepped enough to sew up over the holiday weekend. Farmer's Wife will definitely carry over. Then there are the two new patterns I am trying out for next year. Missouri Puzzle is the big teal block and I framed out one of the leftover nine patches. A motley assortment for sure, but progress is being made. I was looking for a new block for 2016. 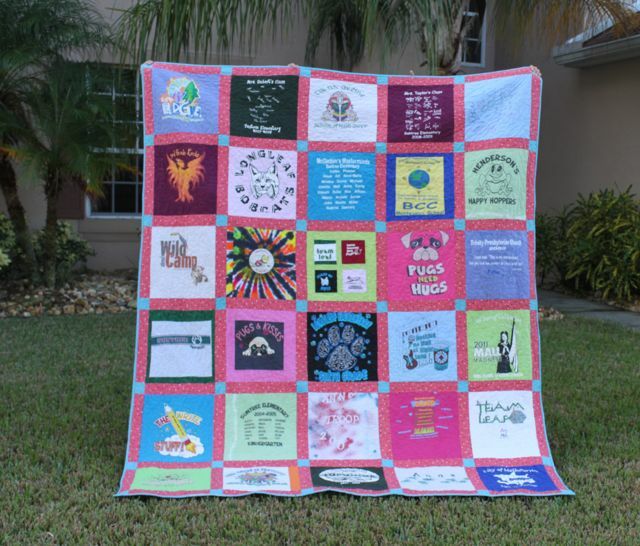 Something large in size so that one or two blocks each month would make a nice quilt by the end of the year. Something that uses common strip sizes. Something "starlike". I thought about Carpenter Star, and Ice Crystals, maybe Swoon. I sketched them out on graph paper and played with colors. Finally, I decided on Missouri Puzzle. It uses 3.5 inch and 1.5 inch strips. It is a 15 inch block. It resembles a star. Best of all, in dark and light, it would make a nice layout for a quilt. Since aqua never got a turn this year, I thought I'd make a trial block with some of the aqua scraps from the cleaning up yesterday. 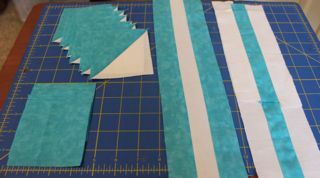 Layer 3.5 inch strips of background and aqua fabric together and use the easy angle ruler to cut 8 HST units. In addition to those you will need 9 3.5 inch aqua squares. These can be all the same or scrappy. I chose to use two shades because I didn't have enough of any one color. In addition you will be making two strip sets from the 1.5 inch strips. Dark-light-dark is needed for the corners of the nine patches, so it only needs 12 linear inches. The light-dark-light however, makes up the center of the nine patches as well as the rail fence portion of the center section, so this will need 20 inches total. It is fine to use multiple sections or make it scrappy. 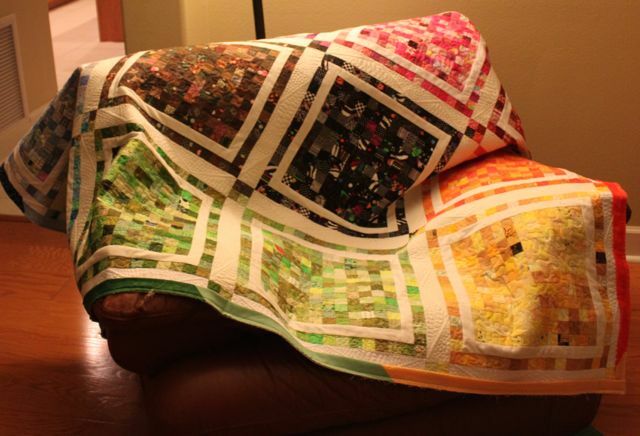 That is part of the fun for scrap quilts after all. 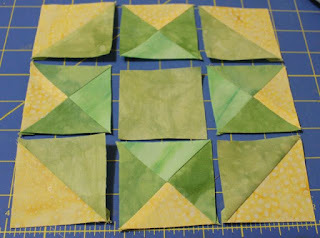 Sew the HST blocks together and make both strip sets. Press toward the dark fabric in both cases. 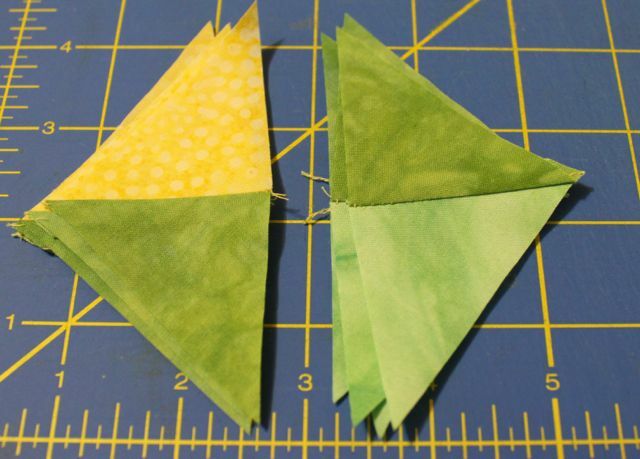 Use the 1.5 inch sub cuts to make four 9 patches with dark in the outer corners. Wow is this a HUGE block. I had to find a bigger cutting mat to put on the TV tray that sits next to my sewing machine. Lay everything out and sew the blocks together. It would be fun to play with the layout on this. I've seen lots of versions with the center edge squares in contrasting colors, but I thought that it took away from the star like quality. The center could easily be an accent or string block. 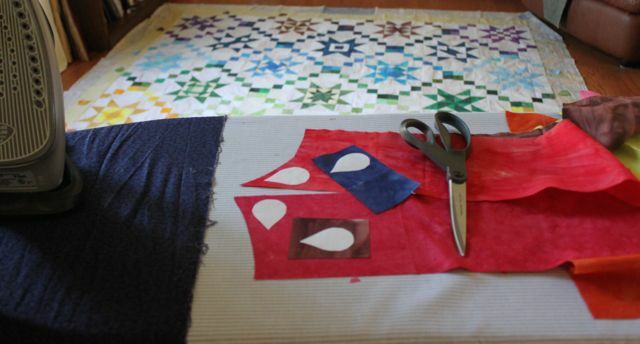 Press carefully and you will have one ginormous 15 inch finished quilt block. Maybe next week I'll try one with the reverse color placement? I enjoyed reading about Kathy's experience with fall and the onset of winter. It has been so hot here that we aren't feeling and change in the seasons yet. It is a rainy day though, so staying in to catch up on slow stitching sounds just right. I have these applique orange peels ready to prep and need to get it done before Thanksgiving when we will have some car time and some sitting around hanging out with family time. 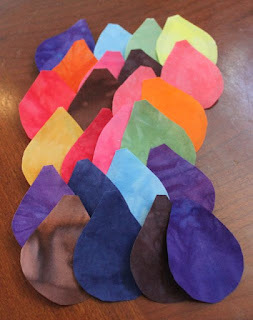 I have new motivation to finish off the orange peels this year so that I can start on Quilty 365 circles on January first. I want mine to be a true calendar quilt quilt with each month laid out in weeks. I have a plan all drawn up, but won't start until this current project is on to the next phase. 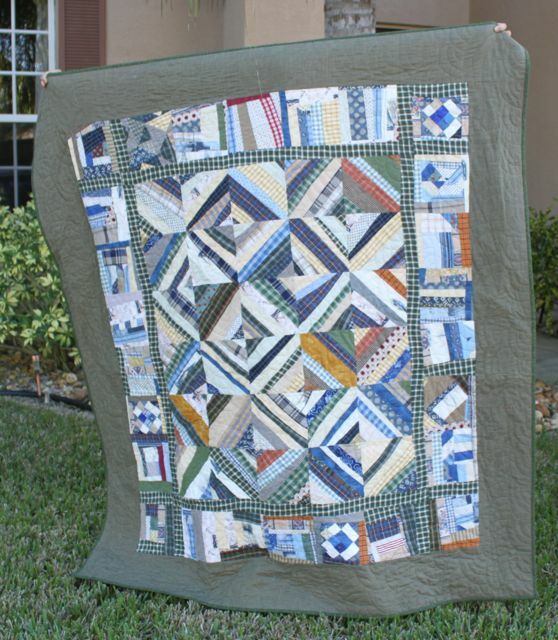 To check out more slow Sunday stitching, head over to Kathy's Quilts. November is all about getting quilts ready to go to the next phase. 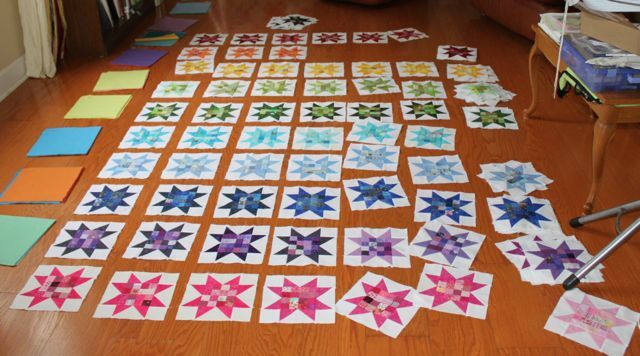 There are enough of these postage stamp stars for two twin sized quilts with a few leftover for fun. They will be set with wide lattice and cornerstones which had me digging in the 2.5 inch square bin yesterday. 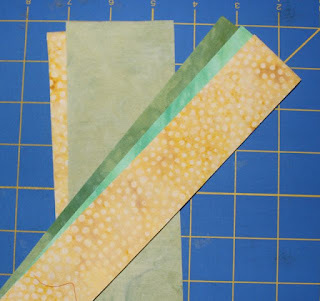 There weren't enough of all of the colors and so one thing lead to another and the rest of the day was spent turning strips into squares and scraps into strips and generally playing with scraps. I have one plastic shoebox already sorted by color and another one ready to be sorted and organized. So, whatever projects go on the list for next year, one of them will definitely need to use 2.5 inch squares. I am thinking about Arkansas Crossroads which would make a nice thematic addition to the Missouri Puzzle that is in the simmering stage. To take a look at more scrap happiness, head over to Oh Scrap. I've been busy putting together plans for next year. Vicki and I have been working together to plan out some color schemes. While it may seem counter intuitive to buy fabric for a scrap challenge, having new colors to enhance the stash is a great way to liven things up. After using up lots and lots of scraps over the past few years of the Rainbow Scrap Challenge, I am excited to be using some of Vicki Welsh's beautiful hand dyed fabric for the RSC16. You may purchase this special selection of fabric directly from Vicki. Best of all, it is on sale for one more week! Go here for all the details. She will be sending two sets of the fabric to me. One to use for a follow along sampler quilt, and one to give away, one color each month, throughout the year. I have been working hard to design a row by row quilt for anyone who wants to follow along in 2016. 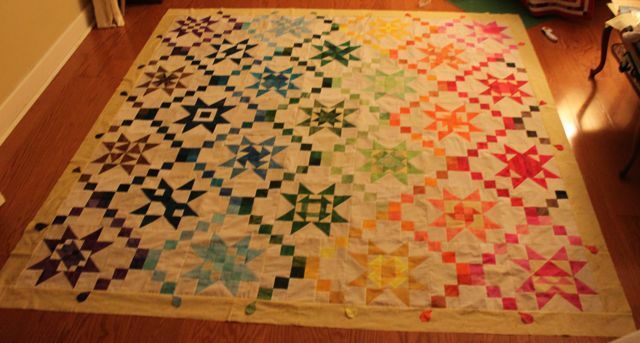 There will be 10 rows, and the final quilt will be twin sized. For those who want a smaller option, I will also offer a 60 by 60 version. 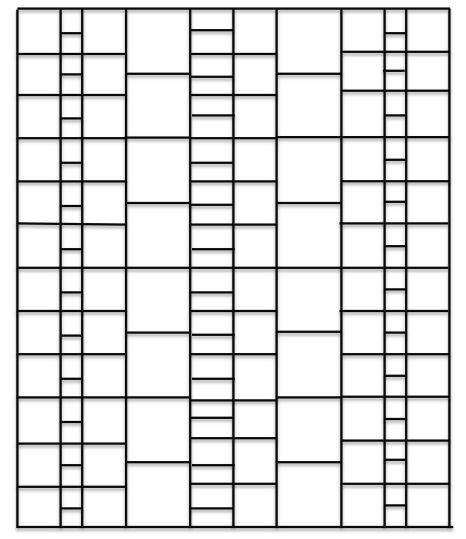 You can even make it larger if you like, by adding two more rows in November and December. The blocks will all be fairly simple and traditional pieced blocks, assembled into rows as the year proceeds. Honestly, they are columns, but I don't think a column quilt is a real thing. It will look something like this, but with pretty rainbow colors inserted into each spot. 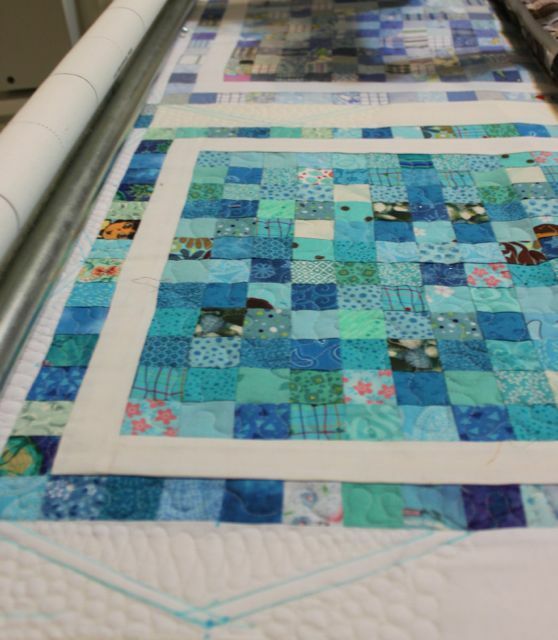 Block sizes will range from 3 to 12 inches, but they will all fit together into equally sized rows in the finished quilt. Ready to play along? Use Vicki's fabric or your own scraps. The choice is yours. Pattern tutorials will be published at the begining of the month starting in January and continuing for 10 months. That will leave a month for assembly and another month for quilting. If you have already started pondering plans for next year, you are not alone. I've seen lots of new blocks in the trail stages on ScrapHappy Saturday. The button is ready for all those planning to join in for next year. Up at the top of the right hand column is a "grab my button" gadget. Just copy the code in the box into a custom html gadget on your own blog and the button should appear. Then anytime you click on that button, it will take you back to the RSC16 page of my blog. 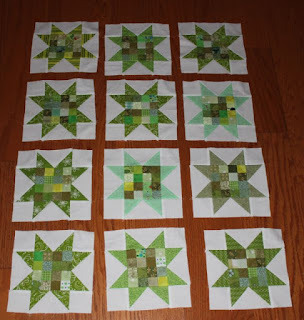 There were enough lime green postage stamps to make these 12 postage stamp stars last weekend. That means there will be enough for to put a row in each of the twin sized quilts that these will turn into. Now I need to decide whether to sew these together and have another quilt ready to go, or keep working on quilting some more on the finished stack. It is a quiet weekend at home! I am so excited to be able to putter around the house for two days. The girls want to bake for Thanksgiving. Ryan needs a haircut. That is all that needs to be done for two entire days. I can't wait! 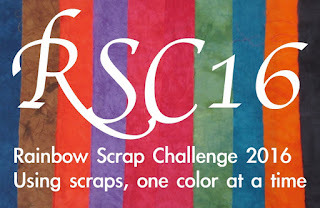 I do plan to spend some time this afternoon firming up the plans for next year's Rainbow Scrap Sampler. Vicki Welsh has planned out some custom dyed fabric based on next year's theme color and I am designing a row a month quilt. 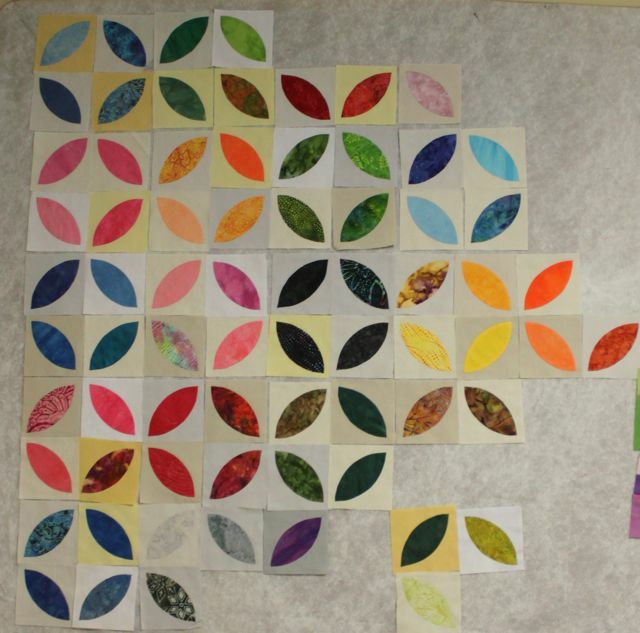 It will be smaller than this year's quilt, and use a variety of block sizes. Check back later today for more details. 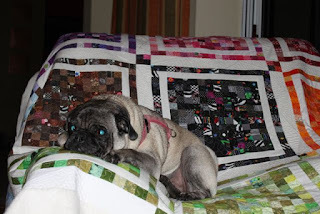 Mister Linky is below so that you can share your own rainbow scrap creations with us all. It has been really exciting for me to start to see finished quilts coming together as the end of the year grows near. I hope that everyone is continuing to make great progress on lime. Some people are doing substitute colors this month, which is great! Whatever you can do to make your scraps work for you. I have been spending plenty of time working on handwork this week. Between binding and appliqué, lots of work is getting accomplished. Last night during the HUGE Iowa football game, almost all of the border pieces for the Sawtooth Sampler were sewn into place. Misterlinky is below so that you can share your scrappy progress with us all. Sydney's LAX team won the first game of her tournament this morning, but they lost the second. Since it was a single elimination tournament, we were home right after lunch. My goal for the afternoon was to finish off the lime green postage stamp stars that I worked on yesterday. I pulled everything out and realized that orange was missing from the collection. Now I just need to decide how many of what type of quilt these will become. I like the 8 by 10 setting with 2 inch lattice and cornerstones, but I'm afraid it will be too big. Maybe two twin sized quilts would be better? I think I'd better do some math and make some decisions. 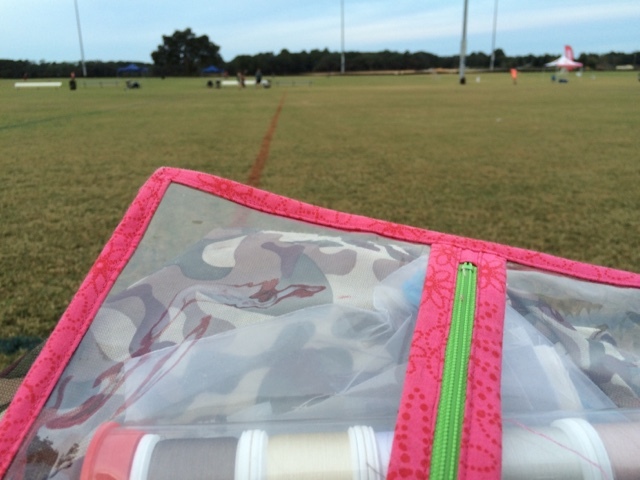 It is early morning in Apopka and I am sitting on the sidelines getting ready to stitch a few orange peels during warm ups for Sydney's LAX tournament. 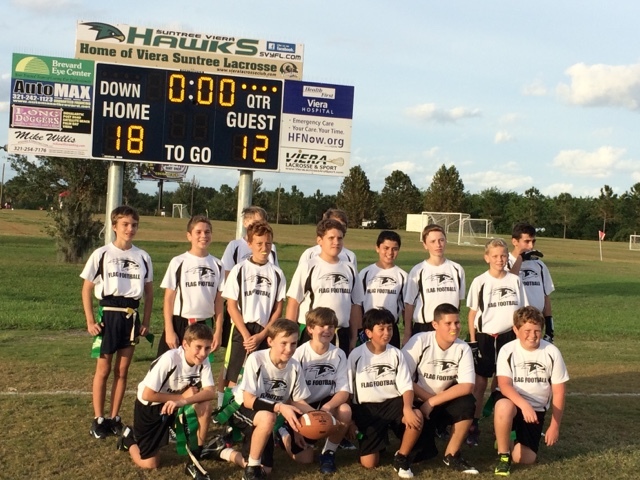 Yesterday was the Super Bowl for Ryan's flag football game, so it has been a sports filled weekend. This morning I plan to work on turning some little 16 patch blocks into postage stamp stars. Two sets of star points are ready to go and two more are cut out. I think that is when I ran out of background fabric the last time I was working on it. I am sure there is more lime green somewhere to make some more star points. The lime makes me smile - so bright and happy. How about you? Lots of lime to share? Mister Linky is below for one and all. At this point in the year, I think most of the people making the Sawtooth Sampler have gotten the alternate blocks down. There was a square count back in June, but now that November has rolled around, it is time to start finishing everything up. You will need 24 lime green 2.5 inch squares. 16 of them will be sewn into 8 four patches. 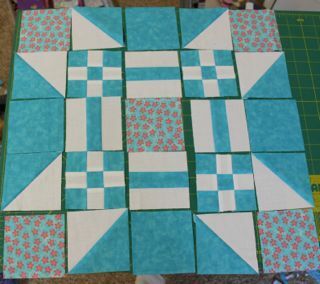 Six squares can be sewn together to make "twosies". The last two blocks are combined with yellow to help transition. Basically, the lime blocks form a big "M" shape over the top of the two lime blocks. 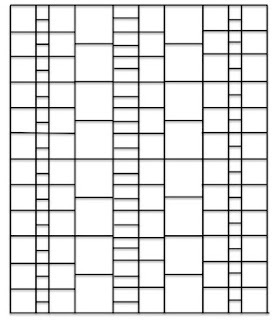 Fill in the rest of the "X" blocks with 4.5 inch squares and you are good to go. These are the last alternate blocks. 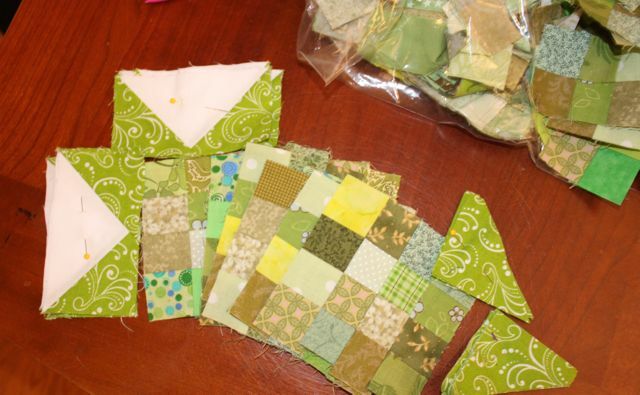 You are ready to sew your blocks together and start pondering border options. Green strings are done. 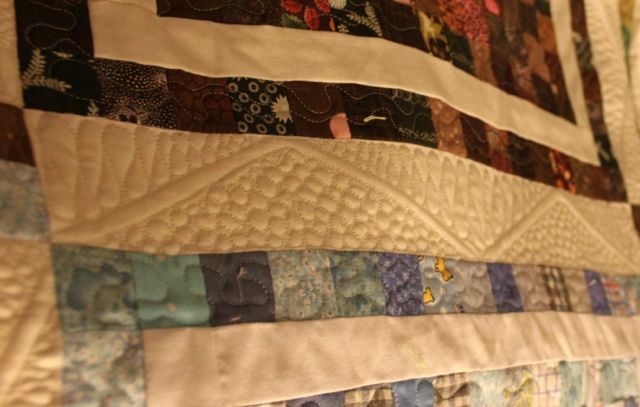 This quilt started as a stack of leftover string blocks. Most of those came from extra fabric leftover from men's shirt quilts. 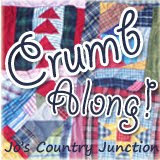 That flimsy didn't seem quite big enough to make a quilt, so I dug deeper and found some crumbs. 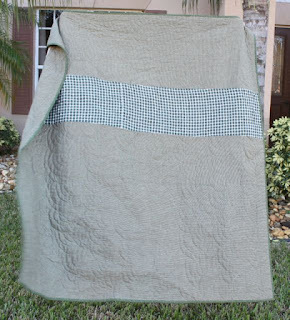 The back was also stretched out with some of the extra green checked fabric from the inner border. 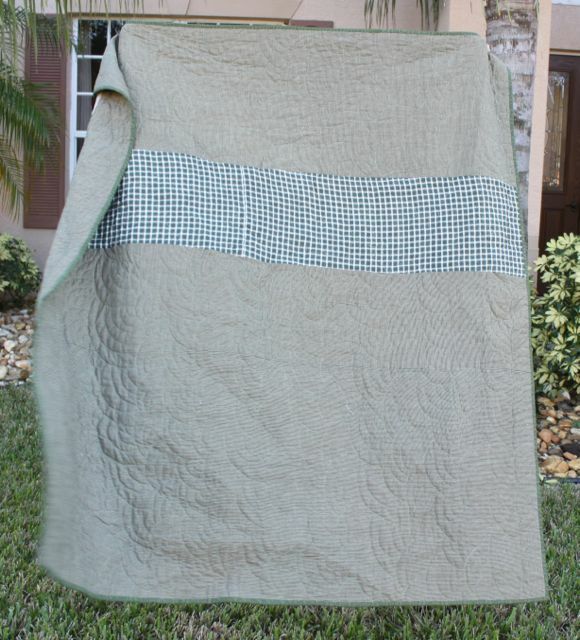 I also added a new tab at the top for finished quilts and added this quilt to the list of finishes for 2015. Now I'm off to see if I can add another quilt to the finished list for this year. Last night during yet another presidential debate, I finished the last stitches on the binding to Anna's T-Shirt Quilt. These are all of her T-shirts from elementary school. She picked out the shirts and the fabrics, and even helped a bit with the ironing and prep work. The girls weren't quite tall enough to hold it up all the way. Then they wanted to make sure that they were in the photo. Today is Veteran's Day, so there is no school! Kurt has taken the day off as well and we have planned a family outing. After much discussion, the kids picked a small, local theme park called Andretti. It doesn't open until 10 though, so I have one some more quilting time to enjoy first. As the end of the year starts for feel real, I am taking stock and trying to figure out what will be done this year, and what will not. I can't help but to think about new projects for the new year, but first some of these ongoing quilts had better see their last stitches. The Giant Postage Stamp blocks are loaded on the quilting frame and sure to be done sooner rather than later. These orange peel blocks are well within reach. I have plenty of blocks prepped and ready to applique. 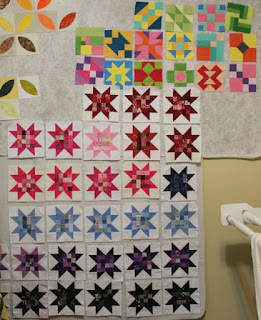 The Sawtooth Star Sampler is oh so close! I have teardrops ready to applique down. That shouldn't take too long. I'm not sure how many of the postage stamp star blocks I have. I should figure that out I suppose. The Farmer's Wife blocks are just getting started, so those are sure to carry over. Yikes! That is a lot of irons in the fire. 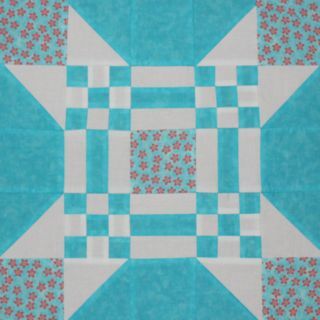 After much consideration as to what to do with the borders, I finally decided on applique teardrops to extend the cross blocks from the center. 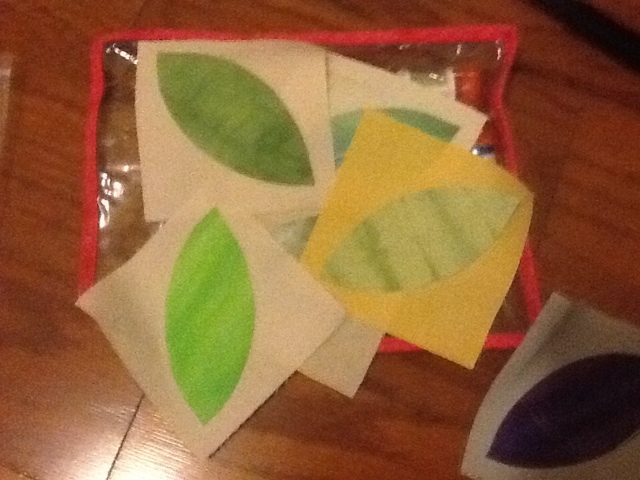 Making more four patches would have been ideal, but without background fabric, that just wasn't going to work. So I found a teardrop shape on google images and printed out several sizes and shapes to see what would work. After finding one with the right proportions, I cut out freezer paper templates and ironed them onto the right sides of the fabric. Here are my 24 rough cut teardrops ready for a bit of prep work. They will look something like this when I get them sewn down. Now the best part, I get to settle down and spend a little time with needle and thread doing slow stitching. What a perfect way to spend a Sunday afternoon. 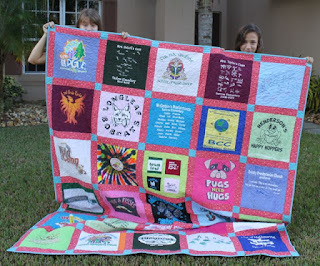 To see what other slow sunday stitching is going on in blogland, head over to Kathy's Quilts. I got the giant postage stamp quilt all loaded onto the frame yesterday, but then the kids wanted to go to the fair. Not the quaint country fair with jam and quilts, but the seedy carnival kind with funnel cakes and scary rides. So first thing this morning I got up and started the quilting. The backing is a soft greenish yellow, so I am using a maize colored thread in the bobbin and white in the top. I am trying to do something fancy in the large white sashing strips. I'm not good with fancy, but it is fun to try. First though, the girls want to go shopping. Apparently they don't have any winter clothes at all. It was 85 most of last week, but they want long pants. We will travel north to Atlanta for Thanksgiving, so having something other than shorts and t-shirts might be a good plan. Hopefully they will shop quickly so that I can come home and quilt some more. I think there is LAX this afternoon, but not much else going on today. I was on my way to finishing the borders for the Rainbow Scrap Challenge Sawtooth Star Sampler Quilt 2015. 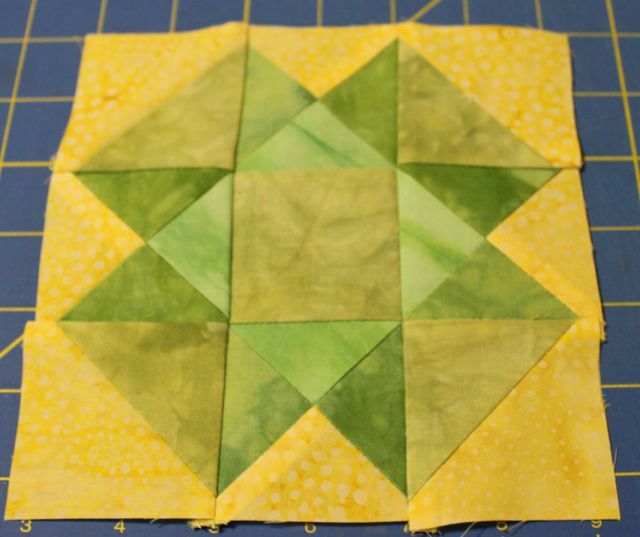 I loved all the suggestions to extend the cross blocks out into the border. After getting out all the leftover fabric and starting to lay them out, I realized that I was out of background fabric. How did that happen? I tried the grey, but it was really too dark. There was, however, a fairly big chunk of slightly darker dotted background batik fabric. 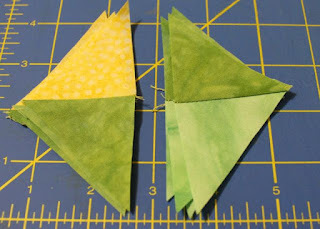 I am considering some teardrop applique to extend the pattern, but first, I need another piece of background fabric. So close! Fortunately, most of my fabric comes from Connecting Threads and they still had more of the same fabric. It was even on sale! So three more yards are on the way along with enough other fabric to get to the free shipping with a $50 order. Why three yards when I only need a piece 4 inches by 30 inches? You just never know when extra background fabric will come in handy. There is fortunately, plenty of fabric for the backing. I can get that pieced together and be ready to go when the last of the border fabric shows up. Swamp Angel Star is a pretty block with a very strange name. It is a minor variation of the Ohio Star block from earlier this month, so it should go together pretty quickly. The corners are replaced with HST units, which gives it a nice dimensional look. You will need 1.5 inch strips in green, green and background along with 2.5 inch strips in background and green. Place the 2.5 inch strips right sides together and use the easy angle ruler to cut 4 HST pairs. 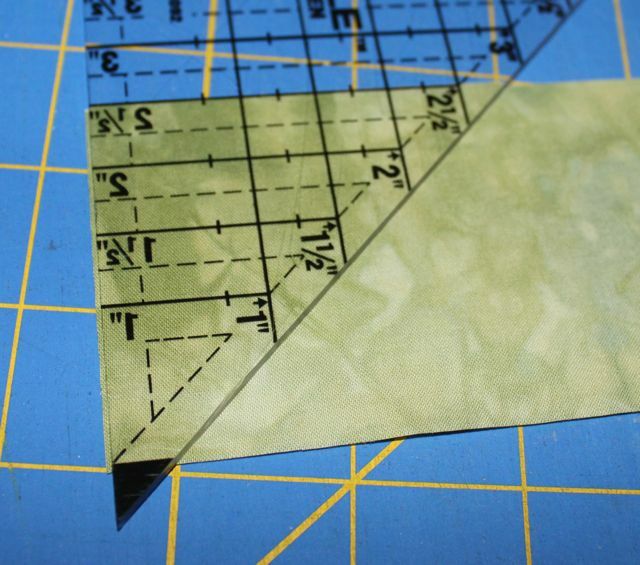 Next, layer up the 1.5 inch strips and cut them with the easy angle ruler. You will need 4 of background, 4 of brighter green and 8 of the other green. Finally, cut a 2.5 inch square of green fabric. Here are all of your pieces ready to go. Go ahead and Sew the HST units together. Next, start sewing the QST units, first into pairs and then into squares. Here are your finished subunits ready to go. 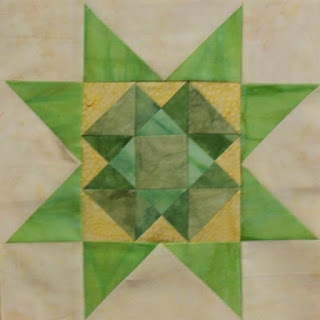 Sew them into a nine patch to make your finished star block. Insert the block into your star points and you will be all set. Tada! 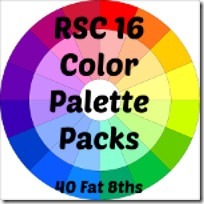 Here is your last sampler for the Rainbow Scrap Challenge Sampler of 2015!